that’s NOT what we signed up for! After all… we’re internet marketers right? We are the “ANTI” 9 to 5 crowd! What the hell are we doing slaving like this for? when I started my lifelong pursuit for TRULY passive income. I realized that I needed to get busy living!!! (working at a used cell phone store at the time). It also required a little thing called income. These two forces however (time & income) never seemed to play nice. … and I knew that when I was getting one, the other was getting away. So I set out to build a better business model. Trying everything from sales, to building a business… even door knocking in the middle of scorching hot Phoenix summers – 122 degrees easy – & asking the (rarely) friendly homeowners if they needed their car serviced. I was making more money than I had ever before, and was working less. It was a damn miracle. Until I tried to grow and hire a team to door the door knocking for me. Here’s a fun question: Have you ever tried to run a team of door knocking, street level hustlers with no supervision? … yeah it was a bit like trying to herd cats. It didn’t work. Theft, No-shows, drug addicts and worse… It was BAD. In fact, I was actually making less, and got to a pretty low place. My girlfriend dumped me, I gained 30 pounds, was 3 months behind in rent, and just plain couldn’t get myself to TAKE ACTION. Anyhow, it wasn’t until I had less than $40 to my name that I realized I was going to literally STARVE if I didn’t do something. So I fired the team, and started door knocking again. It was about that time, that a friend of mine, who worked at an oil shop and knew what a hot mess I was at the time, asked his boss if he would consider paying me a fee if I sent business to him. His boss, Larry (great guy) agreed to pay me $50 for each deal (he called them leads) and offered to have his guys shoot out to the customers house rather than have them come in. GENIUS! So, feeling a bit renewed I went out and knocked until my knuckles bled. Sometimes from 8am – 10pm. I had completely lost sight of my goal. I wasn’t even CLOSE to earning passive income. I was working MORE than ever. Ao once again, I went back to the board and did some very real brainstorming… and had an idea (eureka)! This, being about 2002, and me – owning a computer – got the bright idea to start posting a few classified ads for car repair, rather than hitting the streets. I thought “well… it’s worth a shot”… and within minutes of hitting the “publish” button on Craigslist, I had not one, but two deals. I had just earned $100 bucks in 2 minutes. If I was going door to door, that would’ve taken me an hour… probably more! … and that changed EVERYTHING. And from that point in 2002 forward, I began to absolutely devour every last scrap of knowledge I could find about marketing online. (and trust me, there wasn’t a fraction of the junk that’s out there today). in that vertical, and generating so many leads for my partners, that I catch the attention of a national franchise in the auto repair industry with whomI was lucky enough to hook up a deal… selling leads directly to their franchisees. Meaning that every time a phone call or email is generated from one of our websites, we get paid. …and as it stand now, we’re pushing over 6800 leads their direction every month (and growing)… all while never lifting a finger. And in truth, you shouldn’t. What you should care about is what you can learn from my experience. 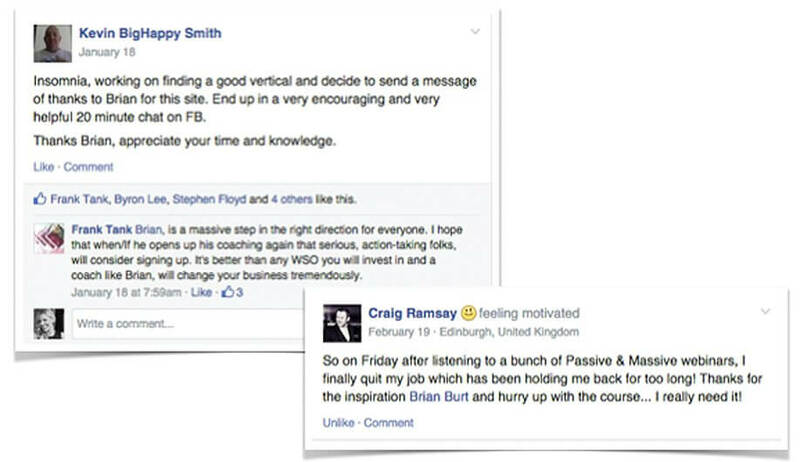 Which is exactly why I put this 6 week intensive Pay-Per-Lead training course together for you. Think of it like the single best set of cliff notes that’s ever been compiled. 12 years of mistakes and successes – trial and error – all in one spot for you to learn the single greatest business model online. and for a lifetime to come. 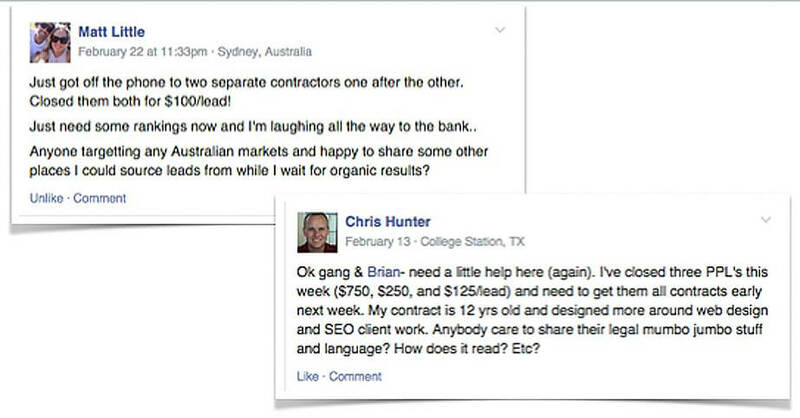 ARE YOU IN CLIENT SEO? SEO has become a mundane commodity. offering their services at a discount. Isn’t time we change course and find a smarter way to build the Client SEO mousetrap? What’s more, if you currently have SEO Clients, you’re in one the BEST positions to move IMMEDIATELY into a PPL business model. (built really out of demand), and as of late I’ve been either liquidating my client base or transitioning them into a PPL business model. Have some chops in the game? Awesome. business model and see what happens. GASOLINE + FIRE = HUGE PROFIT! Here’s the reason I’m launching PPL Empire here today. (maybe you’re a member of the group!) with the sole intention of meeting a few other PPL professionals. And to my surprise, I met very few. In fact, only one. That said, I did begin to see swarms of new members all interested in, what I had previously thought to be, a pretty well known business model. Members began asking question after question – right & left – until I couldn’t field them all. I decided to hold a weekly webinar to help answer questions. The 1st webbys were fun & we had 20-30 people attend. However, within a few months we had skyrocketed to over 1500, super engaged members! Several of these members had reached out to me personally and asked to pay me for private coaching. Which I turned down. However, after about a DOZEN requests I agreed. 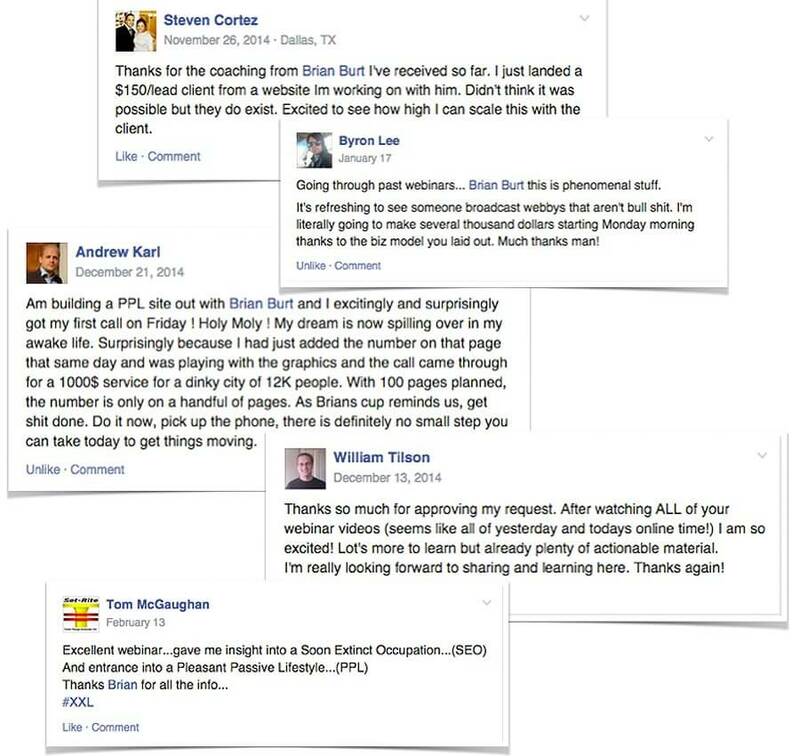 Today I’ve helped over 2 dozen students find REAL success online (some featured on this page even), and have spoken to over 200 others interested in my coaching but could not afford the thousands of dollars I charge each month. Pay-Per-Lead simply makes sense (dollars and sense to be exact). PPL IS AN ETHICAL BUSINESS! incredibly shady. PPL is truly a “eat what you kill” industry. Meaning that, there is literally no risk for the partners you secure. IN PPL YOU CAN TRULY LIVE THE LIFESTYLE YOU WANT. they immediately disqualify it as “hype” or B.S… and in most cases they would be right. However – here it would serve you well not to do that. In PPL, you can choose exactly how much you want to work. A simple concept that so many businesses cannot achieve. I’ve put a ton of very real thought and work into the course. I am on a mission to create a movement, and more, a community of successful Pay-Per-Leaders… You among them! THIS COURSE WILL MAKE YOU MONEY… LOTS OF IT. Not looking for the freedom lifestyle and ready to CRUSH IT online? This is the community for you. Up to this point I’ve described PPL as a business model that will automate your income, and it will… but given consistent focus and attention, you’ll easily be able to knock out six figures a month… PROFIT. PAY PER LEAD IS THE ONLY BUSINESS MODEL THAT GIVES MORE THAN IT TAKES. In my many travels, I’ve never seen a business model that gives out more than it takes. Let me ask you this: Have you heard the phrase “Trading Dollars For Hours”? Well, if you’re in that boat right now, scale is damn near to impossible, and in truth my friend… you’ll never make it.. and more, you’re literally wasting your time. Pay-Per-Lead is the “dollars for hours” antidote as it (near to) always gives back more in profit than it takes in time and effort. I’m extremely humbled that you’re here and more, I’m very excited to see you transform you life from this point forward as a part of PPL EMPIRE! I look forward to meeting you on the inside… it all starts here!